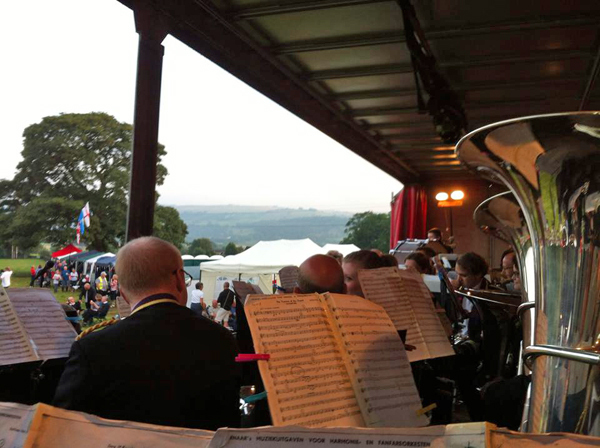 The Proms on the farm concert in Silsden has become an annual event for the Skelmanthorpe Band over the past few years and is always a fine way to start the summer break. Set on the outskirts of the Yorkshire Dales the outdoor event is attended by hundreds of people from the local community who are entertained by a number of musical ensembles ranging from rock to brass. The Skelmanthorpe Band began their first set with the overture ‘Yeoman of the guard’ and received a great ovation for popular tunes such as ‘Greased Lightening’ and Queen’s ‘Fat bottomed girls’ with MD Martin Hall remarking that the latter was aimed at no one in particular! Joining the band at the end of the spot were local singers Sarah and Juliet who received a warm reception for their version of ‘I know him so well’ from the musical ‘Chess’. At 10.30pm the band began the proms aspect of the event, again joined by Sarah and a very enthusiastic crowd. Playing well known proms tunes including Henry Wood’s ‘Fantasia on British Sea Songs’, ‘Jerusalem’ and closing with ‘Pomp and circumstance’ it was clear that no one in attendance was disappointed, cheering the band on for an encore of their final piece. 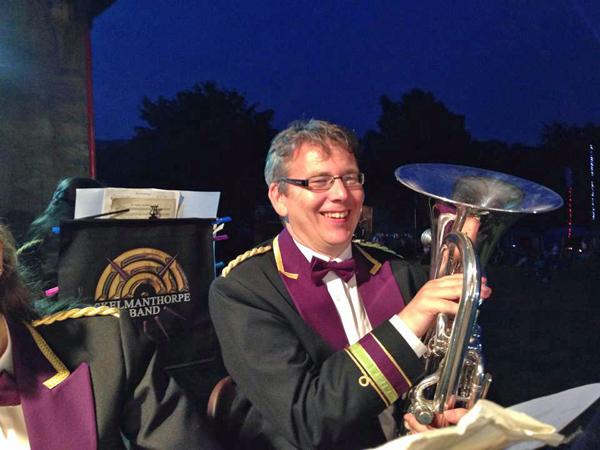 After 7 years with the Skelmanthorpe Band, Rob Cavender has stepped down from his position as Solo Euphonium following the Silsden concert. During the 2nd half MD Martin Hall paid tribute to Rob’s playing talents and we are delighted he will continue to be involved with the band in a non-playing capacity. The band now will enjoy a 4 week summer break before returning to prepare for concert and contesting action in late August.